Why these two cars in particular? Sporty iterations have never done well in India even though such cars are a rage the world over. But, clearly, Toyota and Volkswagen think they can turn the tide with the Liva TRD Sportivo and the Polo GT TSI, respectively. Both cars have only just been introduced and are the only ones in the hatchback segment currently to claim sportier credentials. Perfect reason then to compare the two. So, do they look the part? The Liva TRD Sportivo, in typical Japanese style, is a larger engined, sportier clothed version of the regular Liva. It borrows its 1.5-litre, four cylinder, naturally aspirated engine from the Etios sedan, and gets extended bumpers, side skirts, a roof mounted spoiler and an overkill of the Sportivo badging. We do like the new set of alloy wheels though. Inside, there's more black and grey, and a whole lot of faux metal embellishments. And though the exterior garnishing does help the TRD version standout, it still looks and feels poorly built and finished on the inside. Equipment wise, the TRD starts off on the wrong foot. Unlike the GT which is based on the top of the line Highline version of the Polo, the TRD is based on the middle level variant. So, it doesn't come with fog lamps or even a rear wash and wipe. What it gets though is a regular air con system, manual adjustment for the ORVMs and a steering that only adjusts for rake. The steering doesn't even sport controls for the audio system. The system, however, does get Bluetooth telephony, but it could do with better sound quality. We would have also liked to see the flat bottom steering wheel on the TRD; something the sedater, less assuming Etios gets as standard. The TRD gets ABS, and driver and passenger side airbags, but that's about it. And for all this Toyota expects you to pay ? 10,000 more over the standard 1.2-litre top-of-the-line Liva. The Polo GT TSI on the other hand, looks identical to the regular Polo. There's no body kit and the alloy wheels are exactly the same size as the regular car. These don't even standout. All it gets on the outside is a GT badge on the grille and the bootlid and some cheap stickering on the rear haunches reiterating that this is in fact the GT TSI. The disappointment with the car's lack of flair on the outside is well compensated for with the kit it packs in. But again, there's very little to announce the GT's performance focus on the inside; barring the aluminium garnishing for the floor pedals and some white stitching on the seats and the gear lever, everything else feels very regular. The GT gets more equipment than the Liva, nonetheless. It gets power ORVMs, a multifunctional steering wheel which adjusts for both rake and reach, and a proper single zone climate control system all of which is missing on the Toyota. Additionally, the GT gets a comprehensive trip computer, better designed and thought out cup and bottle holders, and more comfortable seats all round. Moreover, it gets ESP, besides ABS and front airbags, which in itself, is worth a lot. There's also a button to turn the assist off, but ESP never completely switches off; great for safety, but irritating if you want to indulge in some boyish fun. Clearly then, neither car here truly looks the part, inside or out. But, because the GT packs in more stuff, is build better and has better designed and finished interiors, not to mention it doesn't look lame in terms of exterior styling even in stock form, we'd say the Volkswagen has the upper hand here. But, do they feel the part, then? In one line - yes they do; but only in parts. The Liva TRD is a light car. So, with its larger engine which makes 90PS, it improves on the regular 1.2 Liva's performance. It takes 12.8 seconds to hit 100kmph which is about a second quicker than its less powerful version. It also accelerates better from lower rpms in every gear, lending it improved drivability. There's also some improvement in the top speed; the TRD Sportivo managed to hit 161kmph, 10kmph more than the 1.2. However, there are no mechanical changes on the TRD compared to the 1.2. The upside to this of course, is the lovely low speed ride and the long suspension travel, which make it a good car for city motoring as well as for taking on horribly broken roads. For a car with sporty intentions, the TRD is quite comfortable. The downside to it is the uninspiring handling. When you have a car that harps about being sporty the last thing you want it to be, is boring. The engine is good, no doubt. It also sounds purposeful when revved, and along with the light and progressive clutch and the short and relatively precise throws for the gearbox, driving the TRD hard can be enjoyable, but only in a straight line. Come to a sequence of corners and it all turns tedious; it gets worse if the surface is anything but perfect. To make things worse still, the steering has no feel. It's also not very quick. Plus, the car turns into corners lazily and then exhibits a whole lot of body roll. And if there's a bump or a major undulation, the TRD gets out of shape quite willingly; for a driver even with above average driving skills, the TRD isn't a very easy car to catch and set right. The grip from the tyres is alright, but because there's a huge disconnect in what the car does against what you want it to do, you end up praying for the twisties to end. In a sporty car with nicer handling you would, on the contrary, wish for the bends to fly at you thick and fast. That nicer handling car is the Polo GT TSI. Again, the steering feel isn't great, but it is way more precise and quick. Also, the alacrity and progressiveness of the GT's reactions to a driver input just makes you end up driving a whole lot quicker. The turn in is sharper, and because of the ESP, one can be super aggressive with the car without the fear of losing its rear completely. What it does need though are better tyres, which should bring down the understeer; it isn't very bad but better grip will only make the Polo drive tighter still. 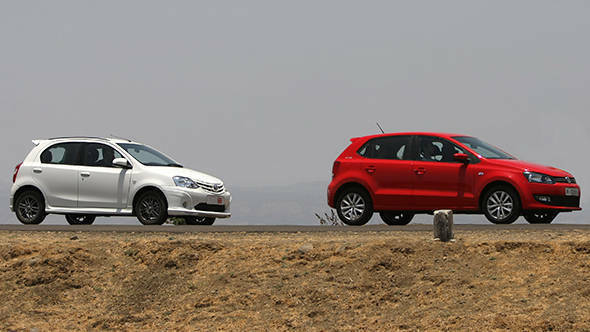 The GT TSI eclipses the Liva TRD even in straight line performance. The GT with a 0-100kmph time of 10.4 seconds is over two seconds quicker. And this divide only gets bigger and bigger as the speeds go up. The GT manages this with a smaller capacity engine but one which uses direct injection and turbocharging. The final outputs - be it power or torque - are higher on the GT, and the engine itself is a lot smoother and freer revving than the Toyota unit. Moreover, because the GT comes with a fancy 7-speed DSG automated gearbox, it absolutely kills the TRD when it comes to driveability. Round two, then goes to the Polo GT TSI as well. The Polo GT TSI then is the better deal, right? The Polo GT TSI is the better car, no doubt. It's faster, it handles better, and is better built and finished. It also gets more equipment and is more fun to drive. But, at ? 9.35 lakh, it is almost ? 2 lakh more expensive than the Liva TRD Sportivo priced at ? 7.36 lakh, and is nearly ? 2.5 lakh dearer than the Polo 1.2 Highline, all prices on the road in Mumbai. So, if money isn't that big a constraint, buy the Polo GT TSI. However, if money is a problem and you still want a relatively fast, exciting hatch to drive, we'd suggest you begin saving up, because the Liva just doesn't deliver on the TRD Sportivo promise.